Keep Virginia Beautiful. Guest Blogger Jessica Casey goes back Green! I myself am a student and I know that the whole crisis with global warming/the increase in littering bothers us more than adults may think. It may not seem like it at times but we do care about our environment. Many schools nowadays have clubs that go around and pick up litter on the campus, or they go around checking to see how teachers left their room: are the lights turned off? Did they turn off their computers? Sure there are still those lazy teenagers who couldn’t care less, and think the world is their personal dump, but most of us don’t like tarnishing the world we live in. So I thought it would be cool if I could find a bunch of school supplies that were Eco friendly! Surprisingly there are A LOT of supplies out that are better for the environment. A constant thing on a kid’s supply list as they grow up is a binder. Binders are often made out of cardboard and plastic; two things that aren’t always great for the environment. I have found binders that are one hundred percent recycled material though. You can custom order them on earthbinder.com. Cool, right? Most kids I know would think so. Pencils are a must have in kindergarten through twelfth grade! No matter how old the child is, myself included, they’re constantly breaking pencils. Pencils are made out of wood, so for every broken pencil think of a tree snapping in half. The problem is solved though! People have started making pencils out of recycled paper to reduce the negative effects of wooden ones. I personally think the recycled ones are cooler anyways… And our pencil cases can be good for the environment! There are ones by O.P.P. (other peoples plastic!). It’s a decent sized container and it comes in different tie dye patterns. Generally they’re better quality than that eight dollar Justin Bieber one. 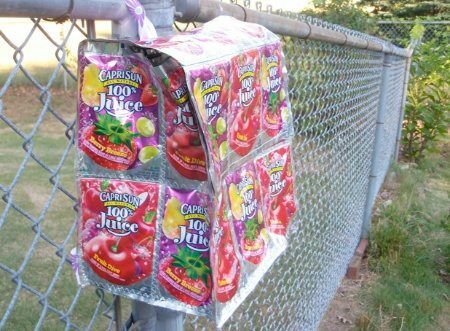 You could get one of the pencil pouches made out of juice boxes! I’m going into my freshman year of high school, and I still drink juice pouches. To me, this is a creative way to make a stylish school supply, and an awesome way to help the environment! Notebooks, folders, and paper are all being recycled too! I’ve learned from experience: things that are green are generally made better. A lot of the time, they may not have a pretty print or Selena Gomez pasted on it, but they usually have a witty saying on the front. The type of saying that makes you want to buy it over the latest Pop Princess. There is this really great website, Terracycle.net , where you can get all sorts of school supplies made from things kids use and recycle everyday. Now you know a capri-sun backpack or doritos pencil box is way cool and really unique. Also if you’re feeling really green you can even sign your school up to recycle the things that they use to make their recycled goods, check it out! Guess what! Your backpack, book bag, back-bag… Whatever you call it can be environmentally friendly too! Instead of getting a plastic one, why not get one made of natural fiber? Companies are now making a lot of hemp bags. That’s pretty awesome! Or you could use the one you had last year! There’s no problem in using your old one. Remember reduce, RE-USE, and recycle. The same goes for lunchboxes, truth is, your old one is still probably more cool than anything new. If you want a new one though, why not get one made out of recycled juice pouches to match your pencil case? They’re called Bazura Bags and are in style right now. Or you could get a Shiva metal one! Metal ones last for years, unless you’re amazingly clumsy like me and drop it, oh, about every day! Then they still last at least two. They are worth the investment, trust me! Paper clips are even being recycled now! They come in many colors yes, but wouldn’t you rather have the pack made of recycled steel? It helps the environment and gives you a warm, fuzzy feeling inside from helping. Even if you are not going to use them, why not pick up a pack for the teacher! Teachers most likely are looking for a greener solution too. How would you like a school supply made of money? There’s a corporation making rulers out of money that is no longer in circulation! That is way cool to me! It’s an ingenious way to get rid of money that’s worth nothing anymore and they last long. Amazing! Check them out at greenraising.com. Staple free stapler? Impossible right? Wrong! Out now are staplers the clip together five pieces of paper easily by poking a hole in them and hook them together like a pocket. It save us from getting them stuck in our fingers alright! Woo, that’s a major help on my part; no more intense staple pain! Yeah! I’m sure there are more supplies out there that I did not mention, but I got most of the important ones. Go back to school more environmentally friendly; there’s no need to harm our world even more. It only takes one to get the ball rolling. Soon everyone will be jealous of yours, or your child’s, green school supplies. I’m going to be the one at my school. The challenge is now yours. Will you be the one? Thanks Jessica, it is so fresh to have a teenagers opinion!